Aside from the obvious benefits of towel rental, such as attracting new customers and retaining current customers, such services have additional benefits. 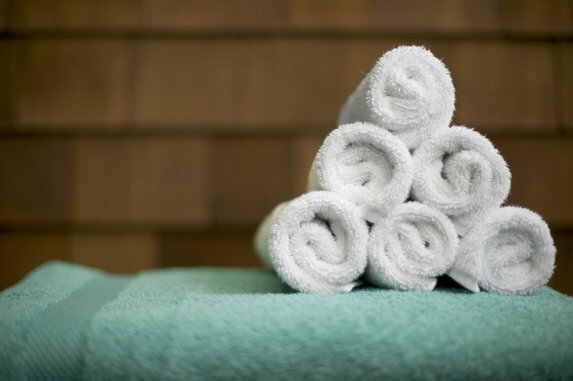 Towel rental can help make your spa more appealing to guests by appealing to the senses. When you are in the luxury business, your guests expect luxury. Spas, for instance, are constantly trying to provide their clientele with a calm, relaxing experience that goes far beyond services provided. In order to fully achieve that luxurious state guests not only desire, but expect, spa owners must appeal to each of the five senses. Sight: This all boils down to aesthetics. While we are taught to never judge a book by its cover that is exactly how our brains are wired. We make snap decisions about a person, place, or thing based solely on appearance. The aesthetics of a spa can not only impact a guests ability to relax, but could also influence behavior and encourage (or discourage) repeat visits. Taste: Many spas will offer their guests refreshing cucumber water, which is not only delicious, but also has several health benefits. The water is rich in nutrient and minerals, helps detox your body, is said to improve the skin, and can even increase your metabolism. Smell: According to a Global Spa Report, 88% of guests visit spas seeking relaxation and stress management. One way spas achieve this is through the use of smells. People can recall smells with 65% accuracy after a year. Whoa! Smell is a pretty powerful sense. And while it may not be what initially attracts a customer to a spa, it can certainly be a factor in getting them to come back. According to researchers at Harvard University, increasing repeat visits by just 5% can boost profits by 25 to 125%. Aromatherapy is a holistic therapy that uses plant’s essential oils to balance the mind, body and emotions. Sound: Have you ever noticed the tranquil music playing at a spa? There is a reason for that. While upbeat music can get you up, get you moving, and have you feeling energized, slower tempo music can quiet your mind, relax your muscles, and help you unwind. Touch: This one is easy for spa owners, as it applies directly to services provided, namely massage. Touch can also be greatly impacted by the quality of towels a spa uses. In fact, clean, fresh towels can appeal to a few more of the five senses. The look of a clean, fresh towel can put a guests mind at ease, helping to establish the legitimacy of your business. The smell of a clean, fresh towel, meanwhile, can be almost therapeutic. We don’t, however, recommend tasting the towels. As your business starts to increase, you can easily expand your towel rental services as well. Scalability is not an issue. If you opt to buy your own towels, meanwhile, you will need to purchase new towels not only as your business expands, but also as older towels wear out. With towel rental, you can easily make adjustments to your rental service as your business grows. If you handle everything in-house, your employees take on numerous additional tasks, especially when it comes to cleaning. It takes a significant amount of time from your staff to wash, dry and fold all of those towels. And the cost to clean all of those towels can add up pretty fast on top of the additional labor. Fortunately, this is all covered in your towel rental agreement. This will help you better manage cost, as well as time. For over thirty years, Lord Baltimore has provided towel rental services throughout Maryland, DC, Delaware, Northern Virginia, and Southern Pennsylvania. Our high level of customer service, coupled with our affordable prices has made us the go-to linen provider for spas and fitness centers in the area. We offer our customers an alternative to the high volume corporate commercial laundries that are all too often big on volume but short on service. To learn more about towel rental, please contact Joe Bateman at Lord Baltimore by calling 800-292-1224. We also handle uniform rental, mat rental, and so much more. This entry was posted on Wednesday, September 23rd, 2015	at 1:20 pm	. You can follow any responses to this entry through the RSS 2.0	feed. Both comments and pings are currently closed.